Okay, so first … first, first, first. I’ve become acutely aware of this beast that is called “out of gamut”. If you’re not a designer and have no idea what that is, basically it means if you print some of these kits out there will be papers and/or elements where the colors may print out differently than what you see on your monitor. Since I’m not a technical scrapper, I was bewildered why anyone would want to print out digital designs that – I assumed – were meant for online viewing. But, since I’m constantly learning about this hobby, I understand why someone would want to make prints. So, since neither of the programs I use (Photoshop Elements 12, PSP8) do gamut checking, it was suggested to me I go ahead and get Photoshop CC. But, I was able to get a hold of an old version of PS that I could at least see if I liked the Motherlode that is Photoshop. I was able to check for gamut and oh my. I checked a couple of the first kits I did and some things were so out of gamut!! Gah!!!! Even the kit for this blog train had a couple of elements that needed correcting. So, I plan on going back and checking all my previous work and re-uploading them. It may take a little time, but I will update you when I’ve gotten them all checked and ready to be downloaded again. **UPDATE – 5/2/15** – Everything should be good now. There wasn’t as much as I was afraid there was. “Tickled Pink” was the worst due to the bold colors. If you re-download anything and have any problems, please let me know. Second, I’ve opened an Etsy Shoppe! There’s not much there right now, but I will be adding more. Now, for the kit! I loved the color palette on this month’s train! The theme “Renewal” meant many things to the designers. I kept looking at those gorgeous colors and “spring” was what just kept popping out at me. So, who am I to ignore my inner voice? I also spread my little designer wings and about half of the elements I created myself using inspiration from Pinterest. I wasn’t sure about that one element that has the lace entwined around the bracket (what would one call that thing anyway?). I worked on that thing for a week or more! Then when I finally had the shading the way I liked it, I didn’t like the ends of the ribbon. So, I added the eyelets. We’d had a challenge a couple of weeks ago doing brads, and I decided to use that for some of the flowers. The preview shows the flowers with centers, but they are separate brads. But, I like the preview with them as centers. 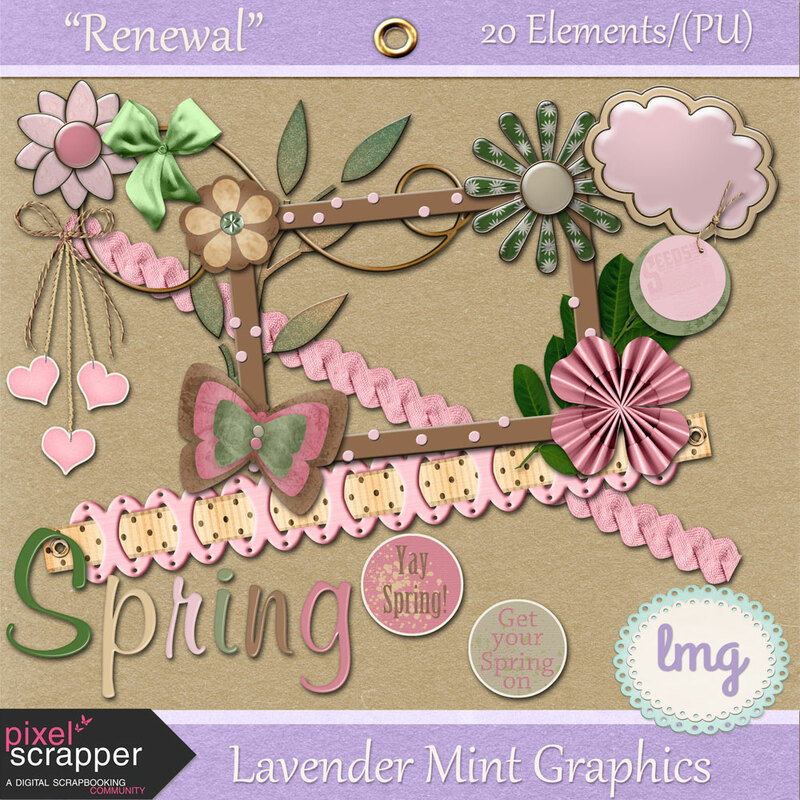 Please visit the other designers for their parts at the Pixel Scrapper May Blog Train. I hope you enjoy my part. I have the full preview first, then the downloads for the papers and elements separately below the images. Thank you, Marcy! I saw your part on PS and love the stickers! You’re welcome thanks for visiting! Thank you so much, this is so beautiful!! Love the colors!!! Love the flowers, frame, cloud and butterfly!! The borders are beautiful!!! 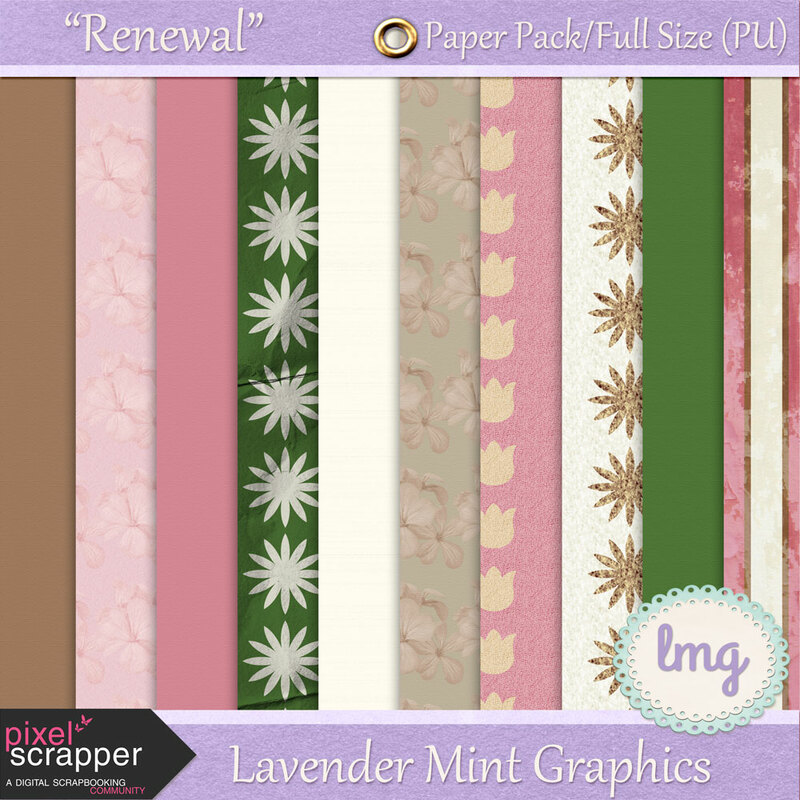 Lovely papers!! Thank you so much for sharing!!! Thank you, Mary, and you’re so welcome. I hope you enjoy it! You’re welcome, Lis, thanks for visiting!